The third annual Student Design Competition seeks innovative, context-sensitive affordable housing solutions on a defined site in San Francisco. As housing costs continue to rise in communities across the nation, planners, elected officials, residents, and developers alike work to preserve and grow affordable housing. Providing inclusive, affordable housing is a large component of creating equitable access to opportunity; however it can often prove difficult to administer and even more difficult to maintain long-term, especially in cities growing at unprecedented rates. How do planners remove barriers to the "missing middle" housing types that increase affordability? How can planners promote inclusionary growth and combat negative impacts of gentrification and displacement? A jury comprised of diverse backgrounds and experience will review all entries. Up to five finalists will be selected to further present their ideas at a National Planning Conference session in San Francisco. A single team will be selected as the Student Design Competition winner during the conference session and will receive a $2,500 award. Learn more about how to enter this year's competition. Co-sponsored by the Divisions Council and the Student Representatives Council, the annual Student Design Competition creates opportunities for interdisciplinary student collaboration while advancing a current Divisions Council Inititiave. Finalists present at the National Planning Conference and the winning team is awarded a $2,500 prize. NOLA Shares features a web and app-based platform that aims to increase and facilitate shared skills, resources and knowledge across the Iberville community in downtown New Orleans. In addition to cloud-based infrastructure, the team proposed physical kiosks installed throughout the neighborhood to guarantee access for all residents. The 2017 Student Design Competition invited interdisciplinary student teams to apply place-based Smart City technologies to a specific New York City site. The winning team, L.E.A.P. from the University of Illinois at Urbana-Champaign, creatively identified a four-part vision — L.E.A.P. to a Smart Future — detailing how Smart City technologies could be used to improve Livability, Empowerment, Accessibility, and Play on site. 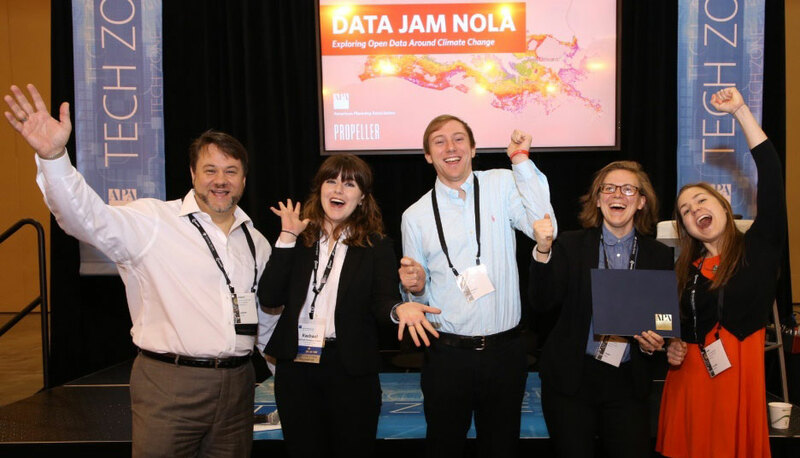 Four additional teams were selected as finalists and presented their ideas at the National Planning Conference in New York City.